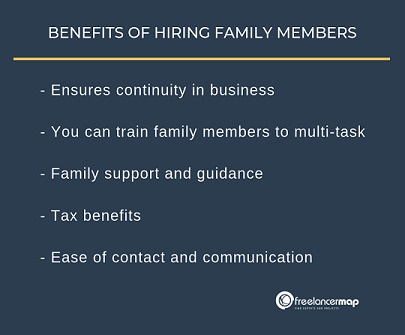 Hiring Family Members for Your Freelancing Business - Yes or No? For a thriving freelance business, getting the right people on board is as important as successful client management. This can sometimes mean hiring family members. Unsure of how exactly to do this or if you even should? 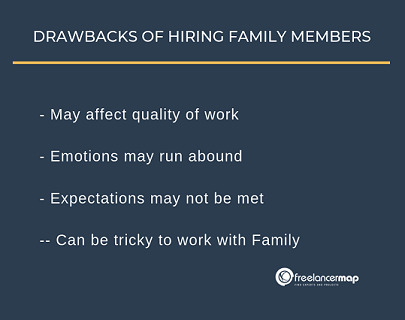 We've rounded up facts and data backing why hiring family members isn't the worst idea after all. While this practice does tend to receive a lot of flak from those who are against nepotism, hiring family has its own benefits – ones you can’t really turn a blind eye to. What Is Nepotism & How Can It Affect Your Freelancing Business? In layman terms, nepotism simply means favoring your family members when it comes to hiring employees – without applying much thought to merit or talent. However, the proponents of nepotism beg to differ – for there are several good reasons to hire family members in any business, big or small. You can train family members to multi-task, allowing you to take your freelancing business to newer heights; e.g. your spouse can manage client communication and your business accounts in unison or engage on social media. That said, a balanced approach towards nepotism is what every freelancing business requires. While hiring family members shouldn’t be a taboo, business owners must create an environment where merit is rewarded, not relations. "When hiring family members, be sure to create an environment where merit is rewarded." So, Is Hiring Family Members A Good Idea? Of course, it is. But only as long as you treat the hired relative the same you do your other employees. The basic fact is: all businesses need an environment where every employee gets an equal opportunity to grow. Thus, formal guidelines for responsibilities and duties must be established for all, irrespective of their relationship with the business owner. The most common family members that will start working in your business are your children and partner. A better understanding of your business and goal Lack of experience / unqualified. Open to training and multi-tasking Difficult work-life balance. So now that we’ve talked about the human factor, let’s take a look at the legal aspects and considerations you should keep in mind. Most Freelancers seek to include their children in their businesses, and why not? As long as all the federal and state child labor laws are met, this practice is completely acceptable. In fact, it’s a pretty tax-smart move that every business can benefit from! It is important to keep in mind that federal child labor laws restrict the duration of work hours, the work timings and types of work that children can perform based on their age. Paying your child – You are not required to pay FUTA (Federal Unemployment Tax) on your child’s wages. And if the business is 100% family owned, and not a corporation or partnership, neither the child nor the business needs to pay FICA tax on the child's wages. If your child is under the age of 18 – In this scenario, your child’s wages will be exempted from Social Security tax and Medicare tax. If your child is 18 years old or older – In this case, you have to pay Social Security and Medicare, but your child still remains exempted from FUTA tax till the age of 21 years. So, apart from enjoying personal benefits like staying closer to your child and helping them learn the ropes, hiring your child as a legitimate employee of your freelancing business is a brilliant tax saving strategy. You can reduce your taxable income by deducting your child’s salary as a business expense. This way, you save thousands of dollars each year! If you run a business and are married, who better to care for your business than your spouse? It makes perfect sense to hire your life partner and better half to be a part of your freelancing business as an employee. But is this move smart enough? Yes, it is. Your spouse has a personal interest in your business and would be willing to work longer hours or at lesser pay than what other employees may charge. It’s a win-win situation. By hiring your partner as an employee, you make them eligible for receiving Social Security credits so that they can receive a Social Security income at the time of retirement. Any amount that you pay on your employees’ retirement plans is tax deductible. So, by including your spouse on the payroll, your spouse receives retirement benefits, while you save your business taxes. Similar is the case with health insurance coverage for your spouse as an employee in your freelancing business. Paying Family Members: Should I Put My Family on Payroll? At the time of hiring, get them to fill out a W-4. While calculating unemployment taxes and worker’s compensation, make sure to include salaries you pay to your family members. If you own a small business, withhold their FICA taxes and include the salaries you pay family members when calculating FICA taxes that your freelancing business owes. Freelancing is a fiercely competitive world. If you find hiring family members gives you the edge you need to grow your business successfully, then, by all means, hire away! While focusing on you businesses should be the priority, it is important to keep in mind that your business is only as good as your employees. Finding good freelancers can be a mammoth task and if you find what you need right at home, everyone wins! Working with family can make a massive difference not just to our morale and personal relationships, but also positively affect our financial hold as well. Deepinder Kaur is one of the happy members of the ever-growing freelancermap family. A wordsmith by day and an avid reader by night, she carries with her years of experience as a freelance writer, marketer, and consultant. At freelancermap.com, she regularly shares some great tips and expert advice to help freelancers make the most of their professional pursuits.